Mt Edith Cavell glacier lake again. A little Antarctica in Canada - one of the coolest places yet. The last couple of days in the Canadian Rockies was pretty cool. Jasper was really cool, and we'd have loved to have had a couple of extra days to spend there, but we had to get back to Whistler for the Great Turkey Sale, held each Canadian Thanksgiving weekend, and to return the car to the hire company. I would absolutely recommend roadtripping through the Banff/Lake Louise/Jasper National Parks to anyone visiting Canada. 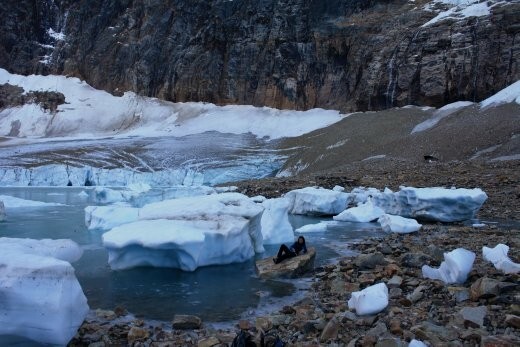 Edith Cavell was a definite highlight - glacier lakes with bits of glacier in them = awesome. On the last day we got to see a load of elk, deer and even a coyote. The whole time we've been out here, we've had exceptionally warm, clear weather for the time of year, so that's a win too. But lots of excellent hiking to be had, very good times. Next step was back to Whistler for the aforementioned Turkey Sale. I'd picked up my snowboard and boots earlier, but Bron needed skiis. The Turkey Sale at Whistler is a Big Deal, and we managed to get in really early on the 'locals day', although if we hadn't read it was locals day we'd have never known. Bron picked up some totally excellent skiis and boots for a bargain price. I got a helmet and some ski pants. We arrived in Whitehorse in the Yukon yesterday. Whitehorse has a population of 25000 people, but is the capital of the Yukon, which has a population of around 30000. Within minutes of checking in to the hostel, we had run into an old uni mate of Bronwyn's from her Architecture days. Ha. Spent the night at the pub with a couple of Quebecians and Bron's uni mate (Allan). There is a local beer which is damn tasty. Apparently this morning, the northern lights were shining here, but we slept through it. The weather is supposed to be clearing today, so hopefully we'll see them tonight. Today is Canadian Thanksgiving Day, and the hostel is putting on a Thanksgiving Dinner. They are saying they'll give us moose, but that might be a case of 'see what dumb Australians will believe'. Still, fingers crossed for some turkey or moose or something. Its pretty darn cold out here, and there should be some snow today. There is some crazy radio out here. Whistler stuff is all sorted, and we're moving in on the 22nd Oct, which should help save some money. But anyways, I need to go swimming in hot-springs and look at giant beavers. More later.